Give your dishes the delicious flavor of crushed chilly and garlic, with the relished flavour and aroma of Indian spices. Caico Chilly Garlic Sauce will leave you tantalized. This is an apt combo for your tea time snacks and a great accompaniment to any fried entree . Let it be salads, soups, meat or seafood preparation, season it with our lightly fermented soya sauce, will enhance the taste of your dish, Chinese or Indian. CAICO Sauces does not contain any MSG and is low in Sodium. CAICO soya sauce is a must for any Asian dish, a little is enough to work the magic. The perfect blend of spices with fairly mild chilly gives an amazing flavour to Caico Green Chilly Sauce. CAICO Green Chilly Sauce adds a signature zest to a variety of dishes and recipes. Experiment with it in your cooking or as a dip, and experience the wildness of chilly. Add a scrumptious twist to your cooking with our tomato sauce. It's remarkable flavour comes from 100% real juicy sun ripened tomatoes that have gone in making it. The real tangy flavour of tomato will leave you craving for more. 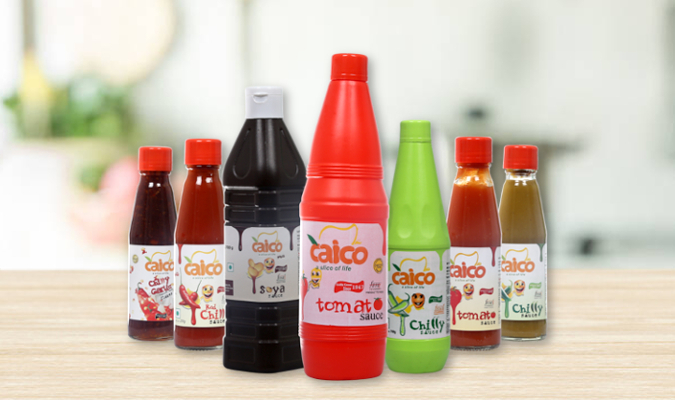 CAICO Red Chilly Sauce is made from high quality red chilly , vinegar and other fresh spices. Our quality standards makes sure that all the ingredients are of right quality to create perfect tasty sauce. Our red chilly sauce can increase the taste of fried rice, noodles and your favorite snack.